Now, the MMDA says it is just a suggestion (4/6). Traffic got you down? Well, unfortunately even if it lets up, you still can’t speed ahead. Why? 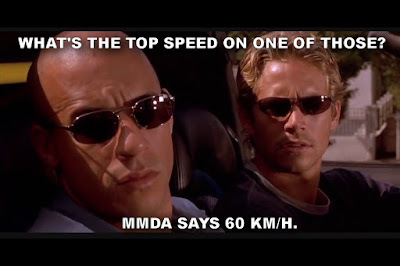 Because, the Metropolitan Manila Development Authority or MMDA just enacted a 60 km/h speed limit throughout the “radial roads” and “circumferential roads” around Metro Manila. R3: SLEX (Up to Nichols as clarified by MMDA). If a motorist is caught, it carries a P 1,000 fine. Based on the published MMDA Regulation No. 19-001, it covers ALL motor vehicles (that includes both motorcycles and cars, public and private), but exempts trucks and buses—so expect them to continue doing a Fury Road style dash from one bus stop to the next (they are supposed to be limited to 50 km/h). This is what happens when they let unqualified blokes get licenses and allow jaywalkers to proliferate everywhere. And what about the traffic accidents caused by bottlenecks and gridlocks which happens most of the time? Ano, wala na silang magagawa diyan? Did i read it correctly??? SLEX is included in the list? Is it even covered by mmda jurisdiction? Yang mga malalaking sskyan bgyan nyo ng mabagal na limit pra pag nwalan ng preno d cla makaperwisyo at makapatay ng mraming tao! ANG GAGALING TALAGA NG TAGAPAMAHALA NATIN AFTER NG MOTORCYCLE PLATES ANOTHER KAGAGUHAN.